webwat: Definitely VoIP (and free calls to the bigger countries) is important, although there are lots of VoIP providers who will let you resell their network. Would be interested in a trial but really need to remove any risk of exceeding data caps etc. Not sure what you mean about the data cap. We don't have one, so you can download and upload as much as you like. Can someone advise if you can stream netflix on superhd using ps3? For those who are already connected? I got the invite. I'm still a bit apprehensive about the lack of phone support. How will the support work if the internet is down and I don't have a smartphone? DarkShadow: I got the invite. I'm still a bit apprehensive about the lack of phone support. How will the support work if the internet is down and I don't have a smartphone? this ISP is for people who just want internet, if you want a phone you shouldn't be joining. I had an unexpected "disconnection" issue on New Years Eve. I logged a support ticket from work via website at about 4PM and it was resolved the next day (by Chrous, arranged by BigPipe) so I was pretty impressed with their service. got cut over today, all working well and no technical issues with the switch from callplus. speeds seem identical locally (full line rate 7Mbps down), similar for a couple of overseas sites I grab files from (80KB/sec-120KB/sec), and somewhat faster for one (work related) ftp site i'm downloading 80GB of virtual machines from (200KB/sec-500KB/sec). Question for BigPipe - are the IPv4 Addresses 'static'? e.g. long leases, or dhcp reservations? Whilst we don't have an inbound call centre (so you can't call us) we do have the ability to call customers if their issue is something that needs to be talked through over the phone. This means we can really effectively prioritise issues, so the customers with the most urgent problems (like no connection!) get sorted first, as well as ensure you talk to the right person first time so you don't get passed around from department to department. We're also considering how we might offer the ability to raise a support ticket directly via SMS, but not decided yet if this is appropriate and/or doable. Having said all the above, we do strongly recommend you get a smartphone anyway. They are great for doing all sorts of other things! Great to see some feedback from some of our customers on here, and glad most things are going smoothly and have been fixed fast when they go wrong. We have also kicked off sending out more invitations to BigPipe, so for those of you who have registered but haven't yet received an invite, you should be getting one in the next few weeks. I've signed up to the testing, fingers crossed! Thought I'd post my experience so far. Filled in the application form about 10pm last night. Received another email this morning at 11am saying "Just quickly. We’ll be hooking up your broadband on 08/01/2014". Another update at 2:40pm saying I was now connected to BigPipe. I had Pandora playing the entire time, so either my internet never cut out or it was so quick that it was <5 minutes due to no pauses with the music playing. So far I'm extremely pleased with the transition. 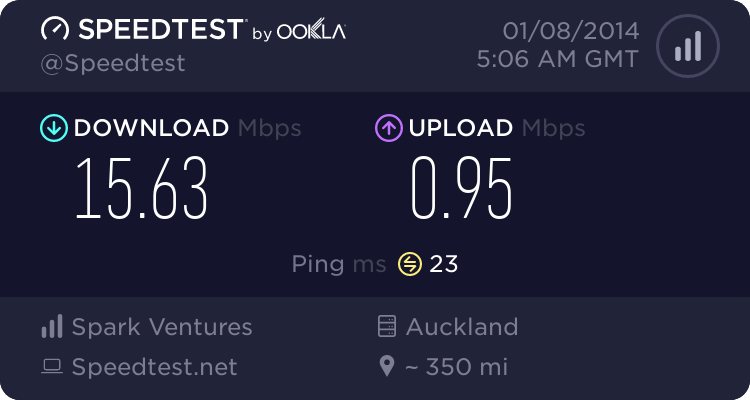 I never had a problem with my previous ISP (Snap) and wouldn't be leaving them if it weren't for a cheaper offer with BP. So it does not need to change the authentication on modem? Both adsl vdsl? I didn't have to change a thing on ADSL. PPP Username / password: anything, just not blank.